One of the most popular patterns on Ravelry is the Clapotis. A Clapotis is a rectangular shawl with rows of dropped stitches for a lacy look. It’s simple but interesting, once you get the pattern established. It can be worked in any weight of yarn, with bigger or smaller needles, pretty much any way you like it. With this kind of flexibility I’m not surprised it’s been knit up more than 17,000 times! It’s time to pick up some yarn and needles and cast on one of your very own. Not only is it a great knit but there is also a party to go along with it. From 7-9 Friday night, May 6th we will be having a Clapo-tea party! Wear your beautiful creation to knit night and sip some tea at the Clapo-tea. Our dear muse KT knit up the most beautiful Clapotis in Handmaiden Mini Maiden so I had to scoop some up for one of my own. I know I know, I can’t help wanting to knit up everything she knits. It’s a sickness. I’m knitting it up in Mini Maiden on 5mm needles. 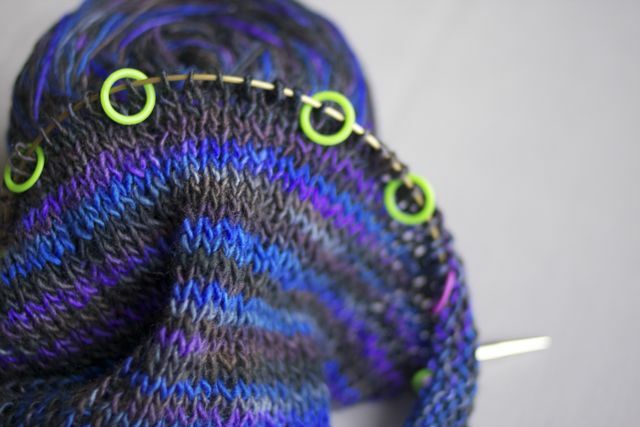 Kynna is knitting hers up in Misti Alpaca’s Handpaint Sock in a pretty rainbow colourway. So, pick up some yarn, some needles, and the free Clapotis pattern here and get ready for a party! This entry was posted on Tuesday, March 29th, 2011 at 1:07 pm	and is filed under Uncategorized. You can follow any responses to this entry through the RSS 2.0 feed. Both comments and pings are currently closed. Kynna told me about this on the weekend, sounds like a great night! I hoped that I could make it over, but my parents go back to the UK the next morning and I have to take them to the airport. Have fun! Your images are not showing up in Safarri browser, is this error on my end? Hmmm, not sure what was going on this morning but it seems to be back up and running on Sarfari now.